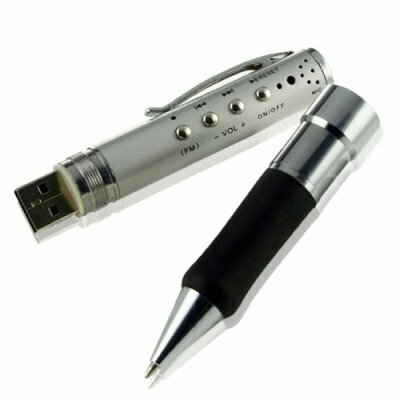 Successfully Added MP3 Music Player Pen with FM Tuner + Voice Recorder - 4GB to your Shopping Cart. This updated version of our popular 4GB digital life pen comes with anMP3 player, FM radio, voice recorder, and 4GB USB flash drive all wrapped up in a professional writers pen. This nice gift item is ideal for those who enjoy writing as well as listening to music simultaneously. You'll be amazed at the ability to record hours of audio from the high quality MIC, carry data safely from the office, and then still use this pen for all your daily writing chores. Imagine writing notes from your meeting as you playback the recorded conversation, or maybe making a type audio recordings of your coworkers office while you step-out, or even just shocking people on the bus when you take out your pen and listen to music as you do your Sudoku. You can do all those things and more with one little nifty device! The CVSC-200-4GB makes an ideal gift for any relative, friend or family member who loves clever gadgets. With this wholesale priced item, there are literally hundreds of useful and fun possibilities! This 4 gigabyte multifunction digital pen is available right now in our warehouse, so order one for yourself and then more to resell on your own internet store. Click "add to cart" now and we will ship out your order tomorrow! Exclusively from the leader in factory direct wholesale electronics - chinavasion.com! How do I put MP3 music files onto this device? Just transfer the files on like you would with any USB flash drive. Does this pen write like a real pen? If I'm recording and the battery runs out of power, will my video be lost? No, the video will be automatically saved before the unit powers off. It looks great I am looking forward to get one for me.